This talk – postponed from earlier in the series – will be the first talk of 2015. 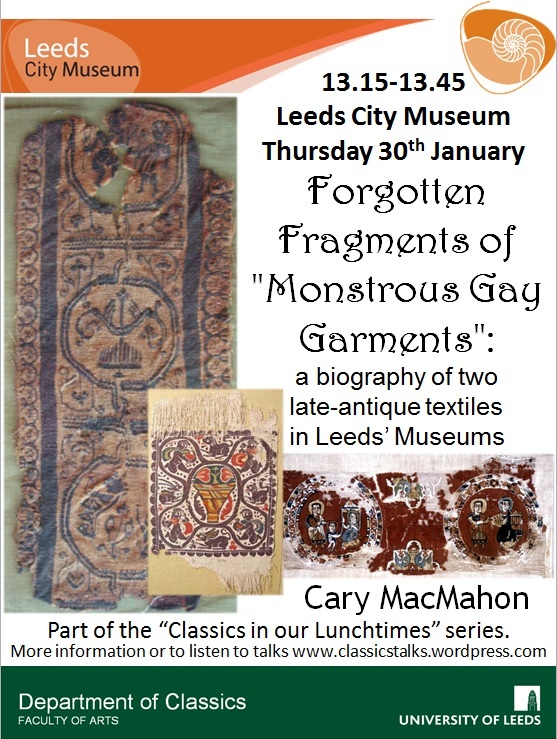 Cary MacMahon will present the biography of two late-antique textiles in Leeds City Museums. She will speak about the survival of fourth century AD (“Coptic”) textiles and the journeys that have brought them – in pieces – to British Museums. Hear about the role of the excavations of Flinders Petrie and the involvement of the Scottish dry-cleaning trade! The focus of the talk will be to contextualise the survival of two specific fragments in the Leeds City Museums’ collection (one in the Ancient Worlds gallery and one at Temple Newsam) and suggest the location of other fragments of what might be the same garment.